Stress cardiomyopathy, also called Takotsubo cardiomyopathy or apical ballooning syndrome, is defined as acute left ventricular dysfunction associated with high stimulation of endogenous or exogenous catecholamine in a critically ill individual. 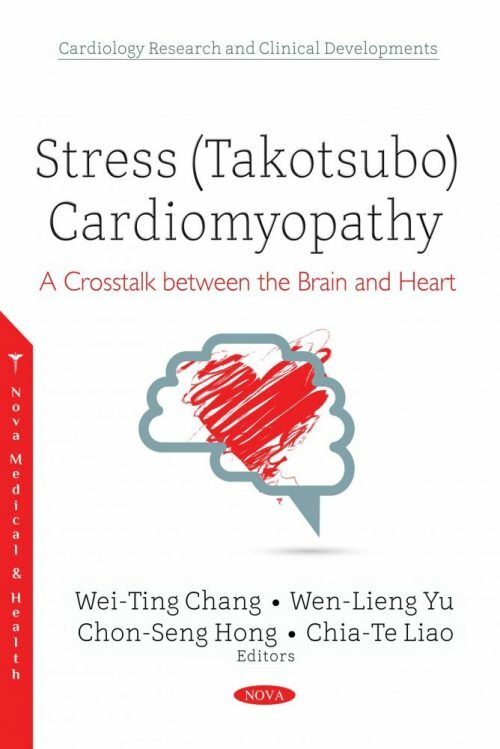 The detailed mechanisms underlying the association between this autonomic storm and myocardial toxicity are comprehensively discussed in this book. According to the diagnostic criteria released by the American Heart Association, the diagnosis of this reversible cardiomyopathy requires: 1) Transient left ventricular wall motion abnormalities involving the apical and/or midventricular myocardial segments with wall motion abnormalities extending beyond a single epicardial coronary artery distribution; 2) the absence of obstructive epicardial coronary artery disease that could be responsible for the observed wall motion abnormality; 3) ECG abnormalities, such as transient ST-segment elevation and/or diffused T wave inversion associated with a slight troponin elevation; and 4) the lack of proven pheochromocytoma and myocarditis. However, the detailed mechanisms through which the autonomic nervous systems regulate the heart and the manner in which their impairment caused adverse effects on cardiovascular function have not yet been well described. Also, increasing evidences indicated that the long term cardiovascular or neurologic impact of stress cardiomyopathy may not be as benign and we thought. Also, there is limited evidence regarding the management. At least recent clinical researches explored whether specific factors explain specific patient susceptibilities to the disease and should be directed towards early identification and stratification at risk. The purpose of this book is to provide an up-to-date review of the clinical presentation of stress cardiomyopathy, discuss possible causal mechanisms, and highlight the recent development of managements. This issue of stress cardiomyopathy comprehensively discussed the crosstalk between the brain and the heart. Experts review the most updated literature regarding clinical profile, imaging modalities, management and infectious or neurologic stress induced cardiomyopathy. The latest information will help medical practitioners in the diagnosis and management of this condition.